The Bone on the Plate. A devotional by Barri Cae. Messianic. sacrificed. Therefore let us celebrate the feast! Jewish families gather together on Monday evening, to remember the Exodus (exit) from Egypt. The Exodus is one of the most amazing Biblical stories. It is mentioned in both the Old Testament and the New Testament. As a Jew, we celebrated this feast yearly. There were no excuses to not be present at the family table for this Seder, this re-telling. One needed to be at the table. One does not need to be Jewish to enjoy the festive elements of this holiday. 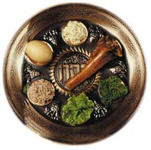 The Passover Seder plate is unique in that it has sections for the various food elements. One of the most striking items is the shank bone from the lamb. Jewish homes will not serve lamb on Passover as the Temple no longer stands. But this shank bone is always included on the Passover plate. The Hebrew word for this shank bone is zeroah, which means arm, not bone. One really cannot have an arm without a bone in it. The zeroah, the shank bone designates the blood of the lamb which was applied: Moreover, they shall take some of the blood and put it on the two doorposts and on the lintel of the houses in which they eat it (Exodus 12:7). For I will go through the land of Egypt on that night, and will strike down all the firstborn in the land of Egypt, both man and beast; and against all the gods of Egypt I will execute judgments - I am the LORD. The blood shall be a sign for you on the houses where you live; and when I see the blood I will pass over you, and no plague will befall you to destroy you when I strike the land of Egypt. The word zeroah is interesting because it means arm, not bone. Etsem is bone in Hebrew. It is almost more meaningful that a lamb shank bone is on the plate because of our LORD, Yeshua. The Passover offering was to be a perfect lamb sacrifice, no bones were to be broken. They shall leave none of it until morning, nor break a bone of it; according to all the statute of the Passover they shall observe it (Numbers 9:12). There are 206 bones in the body and at the time of Yeshua’s crucifixion, He knew all of His bones were out of joint and He could count them (Psalm 22:14, 17). When a bone is out of joint, it affects every ligament surrounding it. The pain was indescribable. Yet, after His resurrection, Yeshua’s skeletal structure was complete: See My hands and My feet, that it is I Myself; touch Me and see, for a spirit does not have flesh and bones as you see that I have (Luke 24:39). In this world of darkness, Yeshua is still the Light of the World. He is a mystery to the world, foolishness to the world, yet to us who believe, He is everything. Isaiah 53:1 states, Who has believed our message? And to whom has the arm of the LORD been revealed? The arm of the LORD, the zeroah Adonai has been revealed to you! Just as the Strong Arm of the LORD delivered the Children of Israel, He has delivered you, He is delivering you and He will deliver you. And the Egyptians treated us harshly and afflicted us, and imposed hard labor on us. Then we cried to the LORD, the God of our fathers, and the LORD heard our voice and saw our affliction and our toil and our oppression; and the LORD brought us out of Egypt with a mighty hand and an outstretched arm (zeroah) and with great terror and with signs and wonders; and He has brought us to this place and has given us this land, a land flowing with milk and honey. Do you find yourself in a hostile work environment? A troubled marriage? A child who has forsaken the LORD and forsaken you? Financial woes? Medical issues? Look to the strong arm of the LORD, the zeroah Adonai. Because you are His child, your enemies are His enemies. He fights for you. As a fighter, He bares his arm (zeroah) to fight unencumbered, the LORD fights for you. Only those who know Him recognize His working power in their lives. Copyright © Barri Cae Mallin, 2011.